They used to tell stories about Shangri-La, a land of peace and prosperity hidden in the heights of the Himalayas. In the adventure that lies ahead, Janet Locke doesn’t find the mythical city, but she does find a new, joyous existence up on the roof of the world. It starts with phone call. An old friend wants to know if Janet wants to join her on a bicycling trip through Bhutan. Janet knows absolutely nothing about the small, central-Asian country. When she looks it up on the Internet, she learns that its gross national product is happiness. Janet, frustrated with life’s challenging moments, decides that this sounds delightful. After a quick stop in Thailand, Janet is on to Bhutan. She falls in love with the charming country. As Janet ventures out into the wilderness surrounding the awe-inspiring Himalayas, she learns lessons about the many worries she carries. Like so many others, this journey will change her life. In Janet’s adventure, author Dr. Frances Rinaldi mixes several spiritual traditions, including Buddhism, Catholicism, and Algonquin and Lakota spirituality. Together, they inspire Janet to let go of her worries and be happy and free. 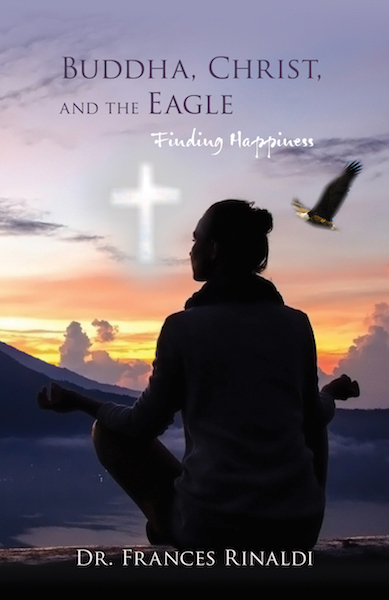 Dr. Rinaldi based her work, Buddha, Christ and the Eagle on her own adventures while bicycling in the Himalayan Mountains of Bhutan. She is an award-winning author, storyteller, and health coach. She has written a collection of short stories called Night Walk, a children’s book, How Silver Fox and Coyote Came to Color the Butterfly. Under the penname F.R. Merrill, she wrote The Final Act, Crossroads, and Murder in Mosaic, a set of suspense thrillers known as the Straton Trilogy. Crossroads was a prizewinner in the Southwestern Book Festival, and Murder in Mosaic won in the Amsterdam Book Festival.